PRICE REDUCTION .. OWNER MOTIVATED ! Designed by Ted Brewer and built by Mao Ta (Taiwan), 'Yankee' , our Brewer 44 Pilothouse Cutter #13 of 15 rare Brewer pilothouse/ deck salon cutters built. She has a comfortable 3-cabin deck salon design with a spacious and light pilothouse with 280 degree visibility for cruising and features a lower helm station. Her decks are flat with wide side decks, a protected center cockpit and an aft deck. She is easily handled with a shorthanded crew and is ideal for inland cruising, extended blue water sailing or she can be a comfortable live-aboard. The 1st owner of 'Yankee' kept her in fresh water on Connecticut River for 10 years. Her current owner purchased 'Yankee' in 1999 and cruised the Atlantic Coast, the Bahamas and the Florida Keys, living aboard for six years before settling in the Tampa Bay Area. 'Yankee' is currently on the hard for a new bottom paint ( peel ) and scheduled to be back in the water in late August. 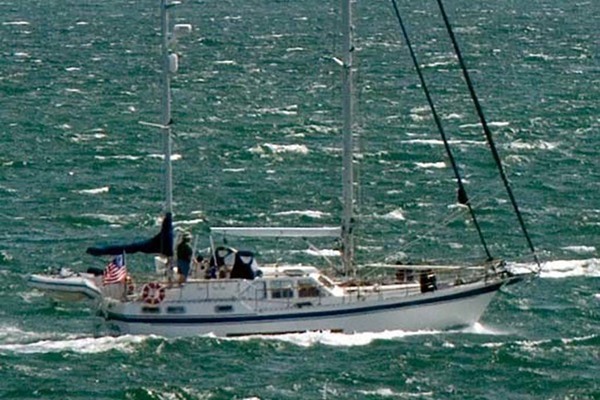 'Yankee' is a rare and spacious blue-water vessel requiring updates and owner is motivated to sell. All offers considered ! 'Yankee' was built using beautiful Taiwan tongue and groove teak panels throughout. She sleeps 8 owners and guests in two staterooms and two heads with showers. U shaped dining table seating for four comfortably at the portside wheel house salon. The salon is well lit with three opening ports on starboard and two on port. An entertainment center, with stereo am/fm/cassette/tape player and remote control is hardwired by the starboard settee. The entire interior is finished in satin varnished matched grain teak. Most of the interior is solid teak planks (not veneer). The settee converts into a full width berth. Opposite the u-shaped dinette is the settee where the back folds up to make a berth. The cabin sole is satin finished teak and holly. There is 280 degree visibility through large upper salon windows, keeping guests and owners out of the elements. The pilothouse helm station has with full and complete instrumentation. To starboard, aft of the helm is a settee that converts into a bunk and accommodates a portable customized "snack table", increasing dinner accommodations from 4 to dinner for 6. The companionway stairs are extra wide with a custom wet locker below. There is 6 '2" headroom throughout. This comfortable cabin has a double berth with an ensuite head. There is a 16000 BTU reverse cycle AC unit (original) for the Forward cabin and Main salon with separate condensing units. 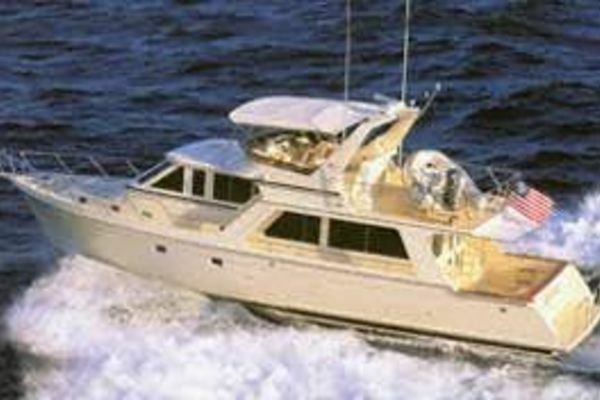 There is a large overhead opening deck hatch offering ample natural light and ventilation. Storage is found in a hanging locker aft and lockers to port and starboard. Two separate VacuFlush head systems, complete (redundant) pumps and holding tanks with optional discharge. The Master Stateroom Head also has a very large enclosed shower stall with forced air exhaust. Robertson hydraulic autopilot ( new 2006) - includes hand held remote for on deck operation and features rotational gyroscopic compass and NMEA standard integration. Datamarine link 5000, combination speed, wind and depth sounder with remote in cockpit. Raytheon RL9 LCD radar mounts in cockpit. Hummingbird Fishfinder mounted in cockpit. Uniden Oceanus VHF radio with DSC (2015). . Ample engine compartment sound insulation. Engine is very quiet. Anchors: Primary 88 lb. Delta with 3/8 chain (200ft) and rope/chain windless, Secondary 44 lb Bruce with 200 ft. nylon rope. Ding Davits: (2) Simpson heavy duty polished stainless steel davits for dinghy, each rated for 1000 lbs.